These natural bathroom accessories all feature neutral colour schemes which make them suitable for a wide range of settings. An ideal choice if you want something a little more understated. We stock natural accessories from leading industry brands including Wenko and Croydex so each product you receive will have been manufactured to a fantastic standard. 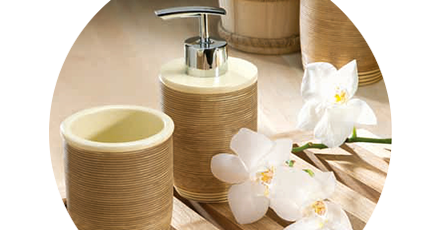 Create a bathroom that's coordinated with our large assortment of accessories. Choose from various bath mats, robe hooks, soap dispensers and more and give your home a trendy, sophisticated feel. Bought as part of a set along with the loo brush holder to add to the finishing touch of my new shower room. Thrilled to bits with this toothbrush holder and the other pieces that I purchased that match this. These pieces certainly look good in my new shower room. As above purchased with the items above and once again it certainly adds something to the finishing touches of my new shower room.